Note that these tests were carried out many years ago. 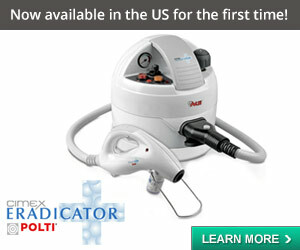 Many products have been created or updated and tested since then. 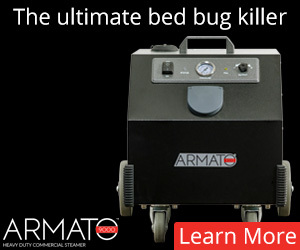 See the Bed Bug Encasements page for the most up to date information we have, and links to more recent testing data. Rick Cooper recently made a presentation at the ESA (December 2007) based on tests he had done on six models of mattress encasement currently being sold and labeled to protect mattresses from bed bugs. This information is now available to us. The encasements tested were: Bed Wetting Direct, Clean Rest, Mattress Safe, National Allergy Classic, National Allergy Elegance, and Protect-a-Bed AllerZip. Each test was run five times on each model, with first instar nymphs. 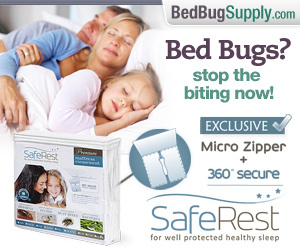 When the zipper is open slightly, by 1-2 teeth, could bed bugs escape? Cooper’s research suggested the Protect-a-bed encasement was the only one which would prevent bed bugs from escaping when the mattress encasement zip was slightly opened. The “BugLock” feature is a quilted pad behind the zipper which is sucked towards the zipper, creating a tight seal even if the zipper of the Protect-a-Bed is slightly opened. I personally used (and still have) the National Allergy BedCare Classic encasement, which did not fare well in this test. Many Bedbuggers have used National Allergy or Mattress Safe covers. Cooper’s research suggests that of the National Allergy covers, the Elegance is likely more effective than the Classic. And it would be essential that the zip not be allowed to open. Many people tape those zippers, as recommended by NA (and by many readers here), but keeping those zippers entirely closed can be very tricky. Cooper’s research suggests that the Protect-a-Bed encasements may now be the most effective encasements for keeping bed bugs inside the encasement (or keeping them out). People who have purchased other types of encasements should not panic. They may work fine. The bottom line is that even the best covers must be used properly and carefully. However, I will be revising some of the FAQs on encasements based on this information. I was glad to see these tests were done, and I hope more research will follow. I performed similar test here in Australia with the CSIRO (Australia’s Commonwealth Scientific and Industrial Research Organisation) in relation to dust mites. The best results we obtained in relation to der p1 and the dust mites was having a cover that one can wash in the wash machine, around 60 C. with standard wool detergent. Not to dismiss the results of his findings but please bear in mind that Rick Cooper helped design the Protect-A-Bed product. I do believe it to be an excellent product. Having worked on the design of the Mattress Safe product I can say that it is 100% effective. There is a clasp and a lock that keeps the zipper locked tight such that it cannot back off. I have seen some of the data for the other brands but have not personally tested them. Rick’s company, Cooper Pest, also sells Protect-a-bed encasements. Re: Mattress Safe covers– as I understand it, Cooper tested two Mattress Safe models–one with a clasp and lock for the zipper, one without. This is described in the third video. The implication was that this type of cover was still available from Mattress Safe, but perhaps you can give us more information on that. Thanks! I was referring to Dust mites covers and not to covers for bed bugs. I don’t know the product Protect-A- Bed. I searched in the Net and realized that it exists here in Australia. Do you know if the product was tested? Do you have copy of the results? 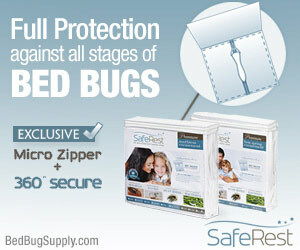 Mattress Safe only sells the lockable zipper models for bed bugs. The non-lockable was the original prototype two years ago. Dr. Semo, Mattress Safe is also available in Australia. Mattress Safe, Protect-A-Bed and National Allergy are the only three brands that I know of that have been tested with bed bugs. Thanks for the clarification! 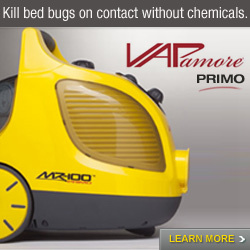 We only do bed bugs here. You’d want dustmiter.com. To address comments made in recent posts by Sean and Nobugsonme regarding the “escape” study conducted on six commercially available encasements. Sean is correct, I was involved in helping Protect-A-Bed in their design. However, all of the initial research that was done on the Protect-A-Bed encasements was performed by an independent third party research laboratory. The study that is presented in the videos is the result of a scientific study conducted and presented as an invited presentation at the ESA annual meeting. In regards to the questions raised regarding the Mattress Safe encasements tested, the study demonstrated that the Mattress Safe encasements were fully escape proof as long as the zipper was in the fully closed position, but failed if the zipper backed off as little as one to two teeth. All of the Mattress Safe encasements tested had the hook and latch associated with the zipper. The first three replicates of the Mattress Safe treatment group utilized the encasements that were commercially available at the time. These encasements had the hook and latch positioned in a manner that allowed the zipper to back off leaving a large opening that bed bugs could escape from even when it was still in the “latched” position. I had previously pointed out this deficiency to the manufacturer of the Mattress Safe encasement and during the study the manufacturer of Mattress Safe sent me a new and improved version of the encasement, which I agreed to include in the study. The new version (not commercially available at the time) had a new hook and latch design that did not allow the zipper to be backed off when in the “latched” position. Ultimately the findings of the study showed that the new design prevented the escape of bed bugs when the zipper end stop was “latched”. However, if the zipper is unlatched there encasement design left no room for error and bed bugs readily escaped when the zipper was backed off as little as one tooth. In comparison, the Protect-A-Bed encasement provided the greatest level of protection in the event of user error in installation potential tampering of the encasement as the “bug lock” feature on Protect-A-Bed allows the zipper to be backed off without allowing the escape of bed bugs. This becomes very relevant if mattress encasements are not installed correctly or if the zipper becomes unlatched. Obviously a design that leaves more room for error is desirable when compared to those that do not offer any room for installation error or tampering. Hopefully this helps to address the areas of uncertainty that have been discussed in previous postings and clarifies the findings of the research that was conducted. I would certainly hope Sean’s comment was not questioning the credibility of the research that was conducted? Thanks, Richard, for your comments and clarification! This is in fact what I meant to say, however your point is well taken. Clearly an encasement that has a design which prevents tampering would be the best scenario. However, none of the current mattress encasements that are commercially available are designed in a manner that achieves this. 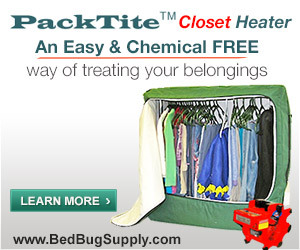 As a result, an encasement is designed in a manner that can still prevent bed bugs from escaping after installation should the zipper back off slightly from its resting position, or if the encasement is not installed correctly (meaning the zipper is not pulled closed fully), a latch is not hooked correctly or completely or becomes unhooked at some point after installation. All of these are common scenarios that can easily occur during and after encasement installation of the encasement. Ultimately the research demonstrates that consumers should exercise care in purchasing encasements. Some are flawed from the start whether or not they are installed correctly or not. Others such as Mattress Safe and the National Allergy Classic were effective as long as the zipper is closed to its maximum extent but failed as soon as the zipper was backed off as little as one zipper tooth. While the latch on the Mattress Safe encasement clearly aids in ensuring that the zipper is closed completely it does not protect against installation error or tampering as does the Protect-A-Bed encasement which was the only encasement tested that was effective when the zipper was fully closed as well as when the zipper was backed off slightly from its closed position. I think everyone realizes just how important and effective encasements are in a bed bug management effort but it is important to recognize that not all encasements were created equally. I see now that by preferring “a design that leaves room for error,” you meant “an encasement that works *even if* the user does not install it properly, or it’s tampered with.” I agree, that sounds like a good thing. I had purchased three of the Protest-A-Bed encasements directly from your company around the time you first made them available. I love the design of the zipper enclosure the only thing that worries me is that while putting them on and onto the bed frame that they may of or may not of ripped, even in a small way, especially where the corners meet the frame. Is there anything that I can do about this to verify that I am in fact protected? I bought them back sometime in the beginning of 2007 I believe. I would also like to take a moment to thank you for all of your dedication to the Bed Bug War and the patience and kindness that you gave to me on the couple of occasions that we had spoken. Once you took time out to speak with me as you were at the airport bringing home your first bed bug dog. I thank you. Thank you for allowing all of your presentation materials to be displayed on the internet. The video and discussion is very comprehensive and extremely detailed. Thank you again for showing this. The reason for contacting you is the following. During the presentation you present a very comprehensive argument that I think is very well constructed and supported. Our current exterminator on the contrary has a very different opinion. My wife and I have been plagued by BB for some time now. We are going into our fourth spray tomorrow. My wife has researched various encasements for some time before making her final decision to purchase the Protect-A-Bed encasement. There were several reasons for this decision. Our current exterminator is not pleased about the fact that we have the Protect-A-Bed encasement. He believes that there is a higher risk of bedbug larve or early stage nymphs to attach to the exterior of the encasements. I have not heard him talking about the interior and possibility of BB escaping. He is worried that the exterior with its fluffiness (not smooth plastic) is a potential danger and allows these early stage nymphs to easily attach themselves. We have vacuumed the exterior several time as the folds in the creases allow opportunities to nest eggs. (1) Should we be seeing excrement or blood spatters on the exterior; or white/purplish stuff when they have nested there. (3) is it advisable (to take off the covers) as suggested by our exterminator; wash the covers; have the mattress applied with poison; and box the box spring and mattress again with the Protect-A-Bed. Your comments and insights are very helpful. I just purchased an inexpensive vinyl encasement from Bed Bath and Beyond. While it does not have the protective layer for the zipper, I merely put tape around the outside of the zipper area in an attempt to “lock in” any bed bugs. We just recently had an inspection of our apartment and absolutely no faecal matter or bugs were found (other than the first and only bug we found last thursday), so I thought that purchasing this kind would be sufficient. If there are no tears in the vinyl and the zipper is enclosed, do you feel that my encasement is ok? I am hesitant to buy 4 protect a bed covers for both of our beds at the cost (at least until we are done playing out waiting game to see if we need to get treatment), so I was just curious what you all thought. Thanks! I personally had bad experiences with the type of encasement you describe. At least one reader, hopelessnomo, did use a vinyl encasement and got rid of her bed bugs. It is possible to tape encasements along their zippers, but people generally find it hard to get the tape to stay on the zipper permanently. And doing so seems to be crucial, if there are bed bugs in the mattress. Have you looked at or tested encasement from xxxxxx. They have a cotton and cotton/ploy blend encasement which look good but does not say anything about bedbugs. Do you think they would work? No. 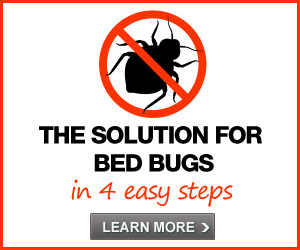 Encasements have to be very carefully designed to keep bed bugs in or out. An encasement which has not been designed for this purpose will not work. I agree–get a STRONG encasement. 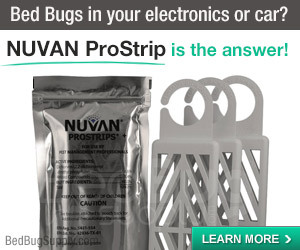 I got the exact same encasement you’re talking about right after the exterminator came for the first time and told me I didn’t have bugs and it might be okay to get an encasement as a preventative measure. It tore as I was putting it on. I will now buy what’s recommended as the best here. I don’t care how much it cost–my peace of mind is priceless. question once home is treated for bed bugs and mattress is encased. then what? what if the do come back then the encasement will be infested? then next treatment pesticides get on the encasement and you sleep on it? is the encasement thick enough where they can be infested like sheets and like sheets don’t they have to be cleaned with heat? i’m confused. is it just plastic that can be wiped down? please help!!!!!! The encasements page will probably answer your questions in more detail. If bed bugs come back, you probably have a better chance of detecting them on the surface of an encasement. And you’ve kept them from moving into the inside of the mattress or box springs. Some mattress encasements can be washed and dried. 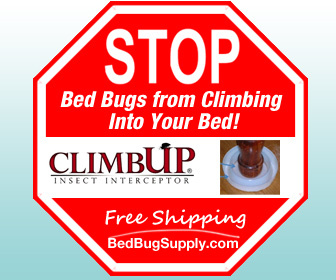 We don’t encourage people to remove them normally, since many of our readers have encased an infested mattress and are trying to keep bed bugs sealed inside the encasement. But should you need to have the mattress treated, or should the encasement need cleaning, this is possible. Please share with us what happens if that hook comes loose or gets torn off. Keep in mind that clothing hooks like this always come off eventually. We appreciate your thoughts on that. Can anyone report on the comfort of the Protect-a-Bed Allerzip? I am looking at them and intrigued by the terry cloth top one. 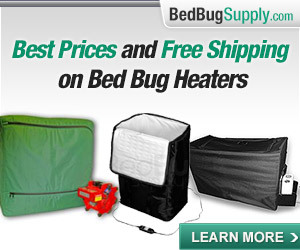 Would the terry cloth be a good harborage for bed bugs? I have not seen or felt any since my first introduction with them a year ago, and just purchased a new bed so this is a preventative measure not a trapping one. Hi, Anaf. We’ve had the Allerzip for a month and a half or so, and it’s as comfortable as a regular mattress pad. Are there any protect a bed products available for the Select Comfort Sleep number beds that have slits and hoses in the mattress itself? Would it be impossible to use an encasement over the mattress? Has anyone had any experience with “Allergy Luxe”? 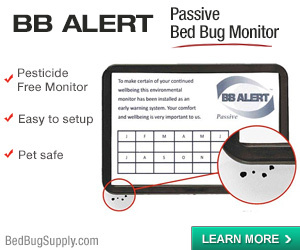 I got it at Bed Bath and Beyond specifically because it had a picture of a bed bud with the words Bed Bug Protection, and it said that it was lab tested and doctor recommended. Also, does the fit matter much? The only size they had were for deep 16″ mattresses, and so it’s a little slack. We’ve duct taped the etire zipper, just to be sure. I have not actually seen the test data for Allergy Luxe. I googled it when the product launched but was unable to find the data. Perhaps it’s available now. You’re right to be concerned about the zipper, as this and the zipper end stop are concerns asfar as bed bugs escaping. I purchased vinyl encasements for far less money and used duck tape across the entire length of the zipper. I have no confirmed that I have bed bugs though I am concerned I may have had hitchhikers on my clothes on the way home from work where there is an infestation. If it is confirmed that I have them then I will get one of the ones mentioned here just for added protection. I will admit that duck tape really does work wonders in a pinch. I find it to be a conflict of interest and unethical for Rick Cooper, which is monetarily involved with Protect-A-Bed, to attack a competitor like this. Remember on video you can make dinosaurs walk and animals talk. This is like having Bill Gates conduct a study between Windows and Apple’s operating system. I would take this study with a grain of salt. Seen my first bed bug on bathroom floor apartment. I ordered Protect-a-bed boxspring and matress encasements. I am going to use my existing matress protector (only fits one side at a time) to to protect the full encasement. 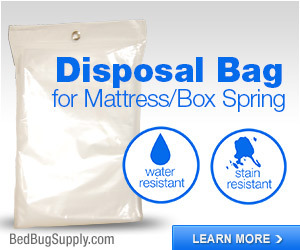 Keep in mind if you use a traditional mattress pad on top of an encasement which is designed to keep bed bugs inside or out of the mattress, you will need to wash and dry the mattress pad regularly as you do your sheets and other bedding (while at the same time leaving the bed bug encasement firmly in place). 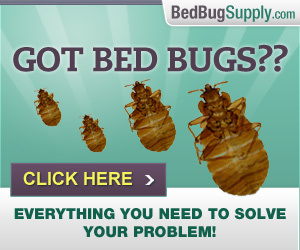 Bed bugs can harbor between the bed bug encasement and the unsealed mattress pad and crawl out to bite you, so regularly checking AND washing/drying the mattress pad is a good idea. I was reading on another site that terrycloth top encasements are better than vinyl because vinyl is uncomfortable(less expansive) and tears easy, but will the terrycloth top get infested w/BB due to the fabric? 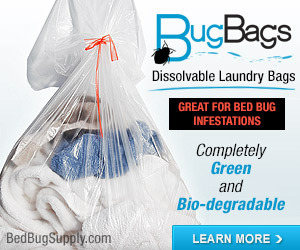 If so, how do you maintain/wash the infested encasement w/o letting BB get in/out the mattress? The terry-top model is one that can work but some people do not like the possibility you mention, and choose to avoid it. Terry-top and vinyl are not your only options. Protect-a-bed, for example, does market a terry-top encasement as well as a “smooth” one (which is not vinyl and should be fully comfortable). I would not use any encasement you felt you might need to remove and wash/treat. However, a removable mattress pad may be placed above the encasement if you could remove and wash/dry it weekly. It would add comfort if you don’t like the feel of your encasement (though this depends on the product you choose); it may also help protect an encasement, for example if pets with claws jump on your bed. I am interested in getting mattress encasements for both my box spring and mattress. My concern is about the encasements tearing while putting it on the mattress. How durable are they? And are they difficult to put on the mattress? Encasements can tear. You need to take care while putting them on. It helps to have someone with you to help. First, put duct tape over any sharp areas on the frame to help avoid poking the encasements. Some PCOs recommend using mattress encasements for the box springs because they are sturdier. If you have a cat with claws, you have to think long and hard about how to keep the cat from tearing the encasement. Once installed, look at the encasement from time to time and put duct tape over any tears which may appear. 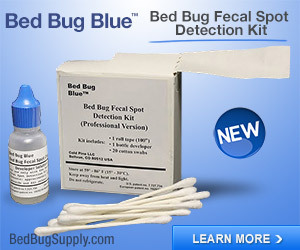 Previous post: How accurate are human bed bug inspectors, k9s?